Christ Church, PCA: Katy, TX > New Resource Available on Our Website! We have added a new resource to our website this week. Starting with the sermon series in the book of Romans, you can now download transcripts of the sermons from Christ Church’s morning worship service. There are varied ways that people learn – some are audio learners, some are readers – and these new transcripts will allow anyone to access the Romans sermon series without having to commit to listening to thirty minutes or more of audio. 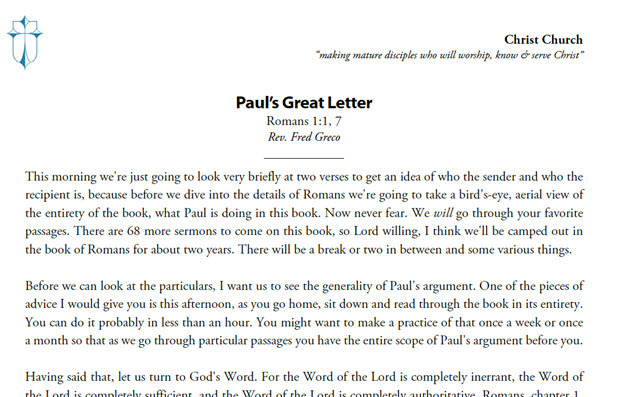 You can download a PDF of the transcript for each sermon from that sermon’s webpage. Just go to “downloads” and download the “Transcript” file. Transcripts are also available from the Notes button of each sermon page in the Christ Church mobile app. We hope that this new resource will be a blessing to you in your study of God’s Word!